No to mention, Google has always been in limelight courtesy to new updated features and services. The very fresh phenomenon or service of Google is expected to serve better websites in average load time or very less load time in Google and serve good website for the visitors. Interestingly, the Google Page Speed Service works as fetched content from the personal server by rewriting the targeted WebPages to optimize the web or online presence. The Google services, then, serves these sites to end users. The prospective potential page load improvements can be adjudged by visiting http://www.webpagetest.org compare. This service is available only for limited users and time. The Google Process–Google will fetch the content from your website and ensure required modifications in the page which will reduce the load time leading to improvement in the website visibility up to 25 to 60%. E- The service will do the concatenating CSS, compressing images, caching, gzipping resources or other web performance best practices. Although Google is offering the prospective services, there are no firm declarations whether the services will be paid or free of cost. Introduced by the official Google Code blog, this new development is an online service which essentially hurries up web pages so that they take less time to load. To accomplish this process, web domain owners will have to point their site’s DNS entry to Google after signing up for the service. The Google Page Speed Service then obtains content from the respective server, rewrites the concerned pages so they’re optimized for the web and then serves these sites to end users via Google servers. Those who access the websites will apparently be unable to tell the difference except for the faster loading time. The new-fangled facility is meant to take up all the work related to concatenating CSS, caching, compressing images, gzipping resources and more. Testing is cited to have shown enhancements of 25% to 60% on a handful of sites. People who are impressed by the results may probably want to sign up for the service. 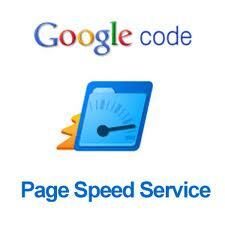 At present, the Google Page Speed Service is being provided to a select number of webmasters for free. Undoubtedly, the company is waiting to see how everyone takes to it before naming a ‘competitive’ price for the service.